Get Your Family Movin' and find out just how fun fitness can be! For over 20 years, JumpStart has been creating the best learning games for kids. 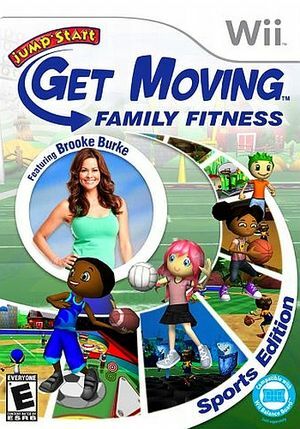 Now, with JumpStart Get Moving: Family Fitness featuring Brooke Burke - Sports Edition, JumpStart is making fitness fun too! Discover the ultimate family sports game with fitness expert and mom of 4, the lovely Brooke Burke. With more than 18 sports challenges in 11 exotic arenas, Get Moving is the fun, new way to keep your family active. Game includes: basketball, baseball, biking, boxing, flying, football, volleyball, speed skating, and more! The graph below charts the compatibility with JumpStart Get Moving: Family Fitness featuring Brooke Burke - Sports Edition since Dolphin's 2.0 release, listing revisions only where a compatibility change occurred. This page was last edited on 10 February 2018, at 04:20.